Weight Pulling (WP for short) is a new and growing sport for all breeds of dogs from the smallest Chihuahua to the largest Wolf Hound. What it involves depends on what organization you get involved with. Overall in all organizations it involves your dog pulling a certain amount of weight on a Sled, Cart, or Rail system a certain amount of feet in a limited amount of time. What Organizations can you pull with? -National Working Dog Association (NWDA) http://www.nwdak9.com/WeightPullHome.html Their main page has not been updated but all show up, and pay an entry fee. Ok, so now I know about the clubs, what do I need to start pulling? First off all before you even start pulling your dog, you need to make sure your dog is old enough to pull. While most clubs allow your dog to start pulling around the age of 1 year, it’s not wise to start pulling large loads until your dog is done growing. (But it’s good to start young) If you really want to get into WP, even consider having a vet x-ray your dog’s hips and elbows to have a look for things that could cause your dog(s) health issues in the future. Your Vet will be able to tell you if WPing is OK for your dog or not. Some dogs with slight hip issues are fine pulling while some aren’t. The first thing you’ll need is a weight pull harness! There are many different websites that offer harnesses for weight pulling, and I’m listing the one’s I have personally used, so I know the quality of the harnesses and how they work. Brown Dog Designs - http://www.weightpullharness.com/Home.html This is my favorite Harness maker ever. If you are going to be doing weight pulling for a while, and really getting into it then you want to break down and buy a BBD harness. They quality of these harnesses are the best. It’s kind of like buying a pair of shoes, you’ll be happy with the $25 shoes, but when you decide to splurge and but the $100 shoes once you realize what you’ve been missing. Her harnesses aren’t made to be pretty they are made to work, and work they do. Stillwater Kennel - http://www.stillwaterkennelsupply.co...lharnesses.htm I’ve never used their WP harness but I know people who have and they love them. Stillwater has adjustable harnesses though for 20lb + dogs that are perfect for WP training in younger dogs. *NOTE* Most dogs ARE scared of the harness when you first try to put it on them. Use chicken or other high prized items to get your dog use to the harness before attaching any sort of weight to the harness. Take your time getting your dog use to the harness and make it a positive experience for them. Even think about putting your harness on your dog for walks at first (use a collar not the harness for the leash) but don’t rush it. Second thing you’ll need is a collar. A simple belt or buckle collar for this is the best; you want it to be loose enough for your dog to breathe easily but tight enough to not fall off while training. Depending on what venue you decide to pull in depends on what type of collar you can use while your dog is pulling. Third thing you’ll need is either rope or chain. I personally like chain because chain causes noise when it’s dragged and helps prepare the dogs in the long run for the noises that the carts make with weights on them. Starting off with either or is fine though. Rope is actually easier to tie the weights with for younger dogs, while chain is better for bigger weights for attaching (I use a spring snap to keep the weights on the chain). Lastly you’ll need weight! For beginners, just start with an empty milk jug with some rocks in it. 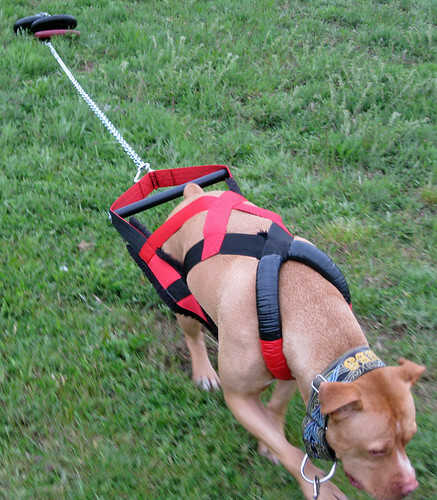 You want it to be easy and just help get your dog use to having the feeling of some resistance on their harness. As your dog gets older and/or more confident then start adding more weight. What to add depends on your dog. A larger dog say 50lbs you can easily add 10lbs without too much issues while a dog that weighs half that may only need 2 to 5 lbs added on. You could also buy a drag sled or make one if you want too. http://www.pulldoggies.com/dragsled.htm A drag sled is just a small sled that allows your weight to be evenly distributed. It’s not necessary but it’s a nice thing to have. Ok, I have everything I need, now what? Now comes the fun part, slowly working your dog up to pulling things! You only want to start pulling your dog 10 to 15 yards at a time. Right now you only want your dog to get use to the feeling and noises of the weights behind them. Hook a leash to your dog’s collar and stand in front of them. Call them to you and start walking backwards SLOWLY. Encourage your dog to pull the weight to you and praise them as they do. If they start to pull but stops as soon as they feel resistance, call them again, if that doesn’t work then LIGHTLY give your leash a tug to get your dog to move, and the praise like mad. Only work your dog for about 15mins the first time out. You don’t want your dog to get tired, bored, or frustrated. Do this for about a week before going onto the next phase, adding weight. A question many people ask at this point is about reinforces (treats). Honestly if you can, refrain as much from food or toy reinforcements as much as you can. Why? Because in most USA organizations food and toy reinforcements are not allowed in the chute. It's better to train the dog from the very beginning to pull for you and for fun. Adding toys or food is a great way to force your dog to do more then it can do which results in harming your dog. I have used food to get the dog use to the harness and for focusing on me, but never for pulling. Once your dog is getting confident with the noise and weight behind them, it’s time to add some weight. NEVER SET YOUR DOG UP FOR FAILURE! You don’t want your dog to stop liking to pull. Don’t try to rush how much weight your dog is pulling. If your dog is pulling 10lbs just fine but at 15lbs he starts faltering, then go back to 10 lbs for a few more days then try 15lbs again. How much weight to add depends on your dog. If your dog is only 10lbs, then adding 1 lb of weight is a good starting place, if your dog is 50lbs then 15lbs is a good starting. If it’s really easy for your dog to pull GREAT but do not add more weight, at least this time around. You want it to be easy right now. This isn’t about building mussel but more about building confidence in your dog. You want your dog to feel great about what it is doing, and enjoy it. Keep working your dog over weeks and months until your dog is at 1 ½ time its own body weight. So if your dog is 50lbs, it should be able to drag 75lbs. At this point your dog is ready for another step, working a cart. At this point you should be working with a mentor or looking for a mentor for help. They will have weight pull cart or rail system set ups or know where to find them. My local WPers have gatherings at one person’s house to work their dogs on his cart and to give each other tips on how to work their dogs better and how to be better themselves. Just remember to have FUN with weight pulling and fun with your dog. Too many people forget this step and I personally think it’s the most important step of all. Make sure to Check out The Nut House for all your Nubs and Peanut updates! RIP--Carter--4/08-- You are truly missed Bud. Great thread! I have it saved for when I get my next puppy. No more pulling for the Bella but I definitely want to experiment with pulling with the next dog. Ditto on the great thread! Now that I have the gist of it, I may have to try it out with Frag after he gets his x rays. He loved pulling around sleds with snow and rocks in them in the winter last year. This is good but some times this type activities can hurt dogs. This can made any serious injury. If we made some protective instruction then we can made these efforts more reliable. Last edited by abraham; 02-25-2011 at 10:41 PM. This is good but some times this type activities can hurt dogs. This can made any serious injury.If we made some protective instruction then we can made these efforts more reliable. I believe they generally only hurt dogs if the dog is not built for the weight it's carrying (bone/joint issues) or if you do not properly build up the weight they can pull. Yes, if you start out with a Chinese Crested pulling 400lbs, it would get hurt, but if you condition a dog the right way you shouldn't have trouble. Actually this sport is safer then sports like Agility and Lure Coursing. The worst I've seen happen in Weight pulling is a pulled mussel that healed in a few weeks and the dog was back out on the track. In fact Weight Pulling helps prevent ACL tears because you are strengthening the dogs knees by pulling weight. 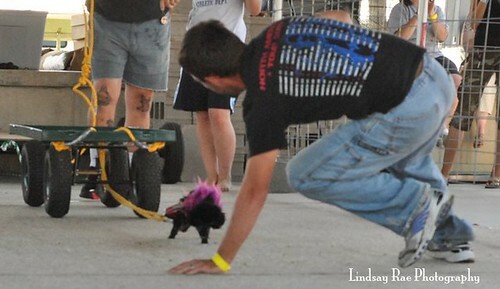 Agility you risk Torn ACLs, Broken legs (when the dogs fall off or land wrong), twisted ankles, and other such things. Lure coursing is the same, that's where my dog tore his ACL, if there happens to be a small hole in the field and your dog's paw happens to get caught in it, or trip over a rock that was missed you can end up with some major damage. What type of injuries are your referring too? Horse has some really successful weight pullers in his pedigree and I have been looking for a post like this to answer all of my questions. I wonder if the events will be difficult to find in my area? Is Husky doggie good weight puller? Assuming you're asking if Huskies are good for weight pulling, then yes. I went to a lot of the web sites and they seem to be more for purebreds. I have a backyard lab/pit and everything else type of dog. Can he also compete and are there web sites out there that aren't breed specfic? Thanks so much, yes this is helpful information. I think you just saved me $150 bucks. I did see directions on one of the sites how to build your own sled. There is a weight pull competion next week in Maine 1 1/2 away. I think I'll run over and take a look and see what's it's all about. I'm putting this site in my favorites. Any pull clubs in western Ny would like to train more closest is 4 hrs away. That's a long way, I bet people would make the trip though if the trainner is any good. Which is your favorite harness? I'm not looking for competion just to keep the dog in shape. we have one for snow, one for rails but dont fit the new dog , and one for agiation., no rails around here but snow is well in adundance, i can travel for a event 4 hrs but as a breede and owner of 11 dogs some very old i cant go that far for training weekly, we just got a dock diving school down the road so next summber will be fun. Weight pull isn't a new sport, but I do hope to see it continue to grow. I hate seeing the anti pet organizations trying to ban it and saying its cruel. It's such an enjoyment for many dogs. Injuries are rare! The only time a dog would be if they have a pre-existing problem or owner is negligent. My dog Peanut is now 1 year and 2 months old and the furthest I've gone with her is twice I've tossed a harness on her and about 3lbs of chain and walked around my small yard once. I just wanted to see how she would react to a bunch on chain following her and she was just fine. I'll start her with actual WP training next spring when she's 2. Here lies the issue with training and morals. Most places you can start WP with your dog as young as 9 months old, BUT you can't test for hips and elbows until they are almost 2 yrs old and stopped growing which I think testing for these things is HIGHLY important because you don't want to WP with a dog with bad hip or elbows. Also pulling heavy weights as a puppy can ruin your dogs joints later in life. It might be slow starting, but at least my dog will be able to WP into their senior years compared to puppies who are tossed in and start having issues by the age of 3. Excellent advice, thanks! I'm going to get him a little back pack so he can get used to things on him!